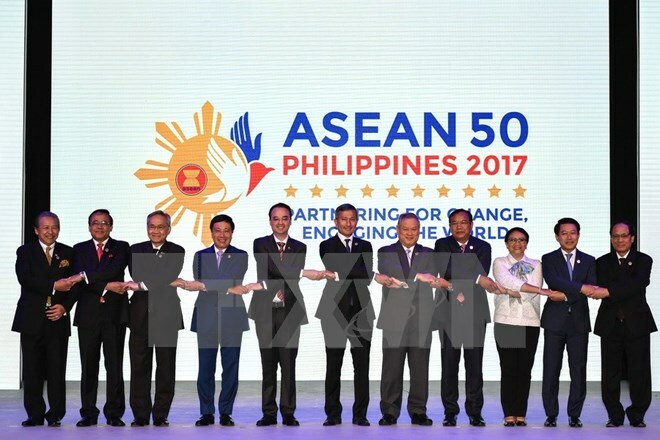 Manila (VNA) – A Vietnamese delegation led by Deputy Prime Minister and Foreign Minister Pham Binh Minh participated in the 50th ASEAN Foreign Ministers’ Meeting (AMM 50) opened in Manila, the Philippines, on August 5. In his opening remarks, Philippine Foreign Affairs Secretary Alan Peter Cayetano said the ministers will discuss regional progresses in implementing important initiatives as well as future orientations for building the ASEAN community, realising the ASEAN Political-Security Community Blueprint 2025, and preparation for the 31st ASEAN Summit and related meetings in November this year. They will also exchange views on regional and global issues of mutual concern such as the East Sea, the Korean Peninsula, anti-terrorism and extremism fight, navigation security and other non-traditional security matters. At a plenary session, the FMs will have an in-depth discussion on working groups’ meetings with 17 dialogue countries, including the US, Russia, Japan and China. Such issues as the denuclearisation of the Korean Peninsula and settlement of territorial disputes in the East Sea, terrorism, violent extremism, and cross-border crimes are expected to be deliberated at the event. The ASEAN Intergovernmental Commission on Human Rights will update the FMs on the human rights situation so as to help them devise measures to promote and protect human rights in ASEAN based on the commission’s Terms of Reference and ASEAN Human Rights Declaration.